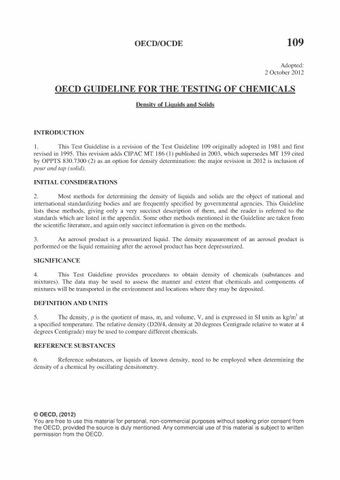 This Test Guideline lists methods for determining the density of liquids and solids, giving only a succinct description of them. The density of a substance is the quotient of its mass and its volume and is expressed in SI units as kg/m3 at a specified temperature. Several methods are for liquid substance only: hydrometer, immersed body method (both are buoyancy methods) and oscillating densitometer. These methods are applicable to liquids with a dynamic viscosity below 5 Pa.s for hydrometer and oscillating densitometer and below 20 Pa.s for immersed body method. The method for solids only is the air comparison pycnometer, and pour and tap. The methods for both liquids and solids are the hydrostatic balance (a buoyancy method) and the pycnometer. The dynamic viscosity of liquids to be investigated should not exceed 5 Pa.s for the hydrostatic balance, and should not be above 500 Pa.s for the pycnometer.